After battling their way through two ten-handed tables to get to today's final day of play, 14 players came with a theoretically equal shot of taking the bracelet. All started with the same stack size -- sort of like a 14-person sit-n-go -- and in the end it was Steven Kelly with all the chips. 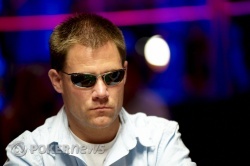 Kelly earns his second cash of the summer, and his first ever WSOP bracelet. A total of 1,397 players entered this one, and after two days the final 14 included two-time bracelet winner J.C. Tran, another WSOP bracelet winner in Justin Scott, and 2007 WSOPE Main Event champion Annette Obrestad. Tran ran into some bad fortune early today and went out in 13th. Then Obrestad came up shy of the final table when both she and Michael Pesek were knocked out in a hand by Derric Haynie. Scott would be the first to depart from the final table in 9th. As others hit the rail, Jeffrey King took the chip lead and maintained it for much of the evening. This was King's fifth WSOP final table and it looked as though this might be the one where he would break through. Finally Dustin Dirksen -- once a WSOP runner-up -- went out in fourth, and Haynie in third, by which point King had relinquished the lead to Kelly. With a 3-to-1 lead in chips to start heads-up play, Kelly pushed his advantage from the start, and within about 15 hands it was over. 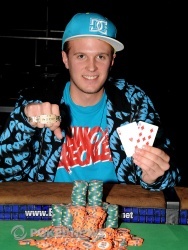 Congratulations to Steven Kelly, Event #39 champion! Come back to PokerNews tomorrow to see who wins the next bracelet as we continue our march toward the Main Event. Jeffrey King open-shoved for just shy of 1,500,000 with the button. Steven Kelly sweated his cards, thought for a moment and made the call. The remaining spectators in the ESPN final table area crowded around the table as the dealer wrapped the tabled and delivered the flop. The on the turn took away King's backdoor flush draw though, and the on the river ended the hand completely. King, very gentleman-like, stood from his chair, shook Kelly's hand and congratulated him on the momentous accomplishment. This was King's fifth final table at the World Series of Poker, and although he couldn't clinch his first bracelet he does walk away with a hefty second place prize; $236,819. Following that last hand, Jeffrey King pushed all in three times within five hands, but got no call from Steven Kelly. We're a little over a dozen hands into heads-up play now, with Kelly maintaining about a 3-to-1 chip advantage over King. Kelly has about 4.9 million to King's 1.4 million. After walking, Jeffrey King just won his first legitimate hand heads up. King limped in witht he button and Steven Kelly checked his option. The flop fell and Kelly checked to King who bet 60,000. Kelly released and King raked in the pot. After winning that first hand of heads-up play, Steven Kelly took the next five hands in a row as well -- all relatively small pots, with just one flop seen. He's edged out further to more than 5 million versus Jeffrey King's 1.25 million. On the first hand of heads up, Jeffrey King limped from the small blind/button and Steven Kelly checked. The flop came , and both players checked. The turn was the . Kelly bet 115,000, and King called. The river was the . Kelly checked, King bet 160,000, and Kelly quickly check-raised to 750,000. King didn't take long to let it go. We're heads-up! Steven Kelly begins heads-up play with about 4.6 million to Jeffrey King's 1.7 million.